Researchers have successfully implanted a neuroprosthetic device onto a human being's retina, allowing him to read four-letter words accurately. The Argus II device has been implanted in more than 50 people, many of who can now see color, movement and objects. 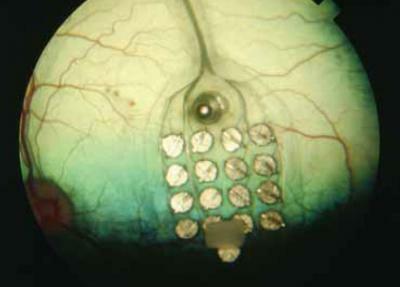 Similar in concept to successful cochlear implants, the visual implant uses a grid of 60 electrodes—attached to the retina—to stimulate patterns directly onto the nerve cells. For this study, the researchers at Second Sight used a computer to stimulate six of these points on the grid to project the braille letters. A series of tests were conducted with single letters as well as words ranging in length from two letters up to four. The patient was shown each letter for half a second and had up to 80% accuracy for short words. "There was no input except the electrode stimulation and the patient recognized the braille letters easily. This proves that the patient has good spatial resolution because he could easily distinguish between signals on different, individual electrodes." says Lauritzen. The first time I read about this idea was in an sf novel many years ago. Frederik Pohl and Cyril Kornbluth wrote about this idea more than half a century ago in their satiric 1952 novel The Space Merchants.